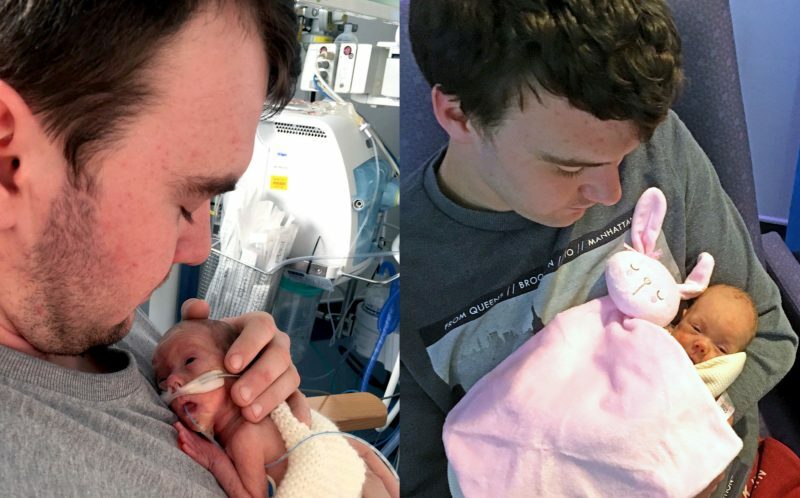 This is the touching moment one of the smallest babies ever born in the UK to survive has her first ever cuddle with her dad. 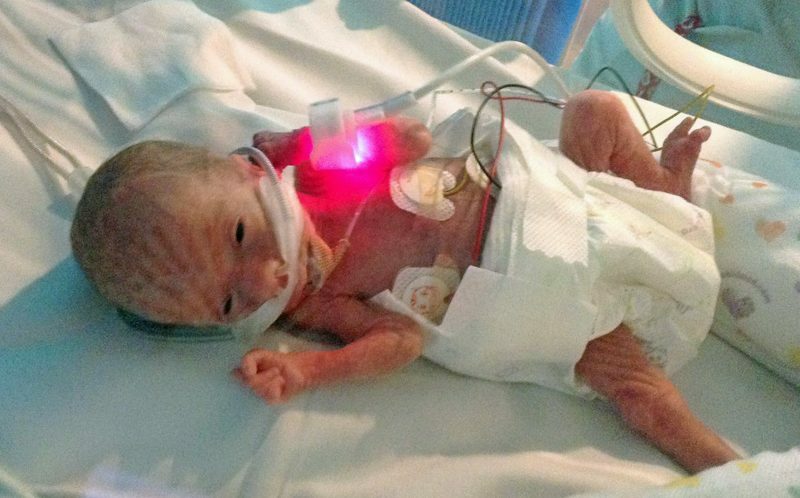 Tiny Macey Micklethwaite, from Worcester, was barely bigger than her dad’s hand when she was born weighing just 551g. 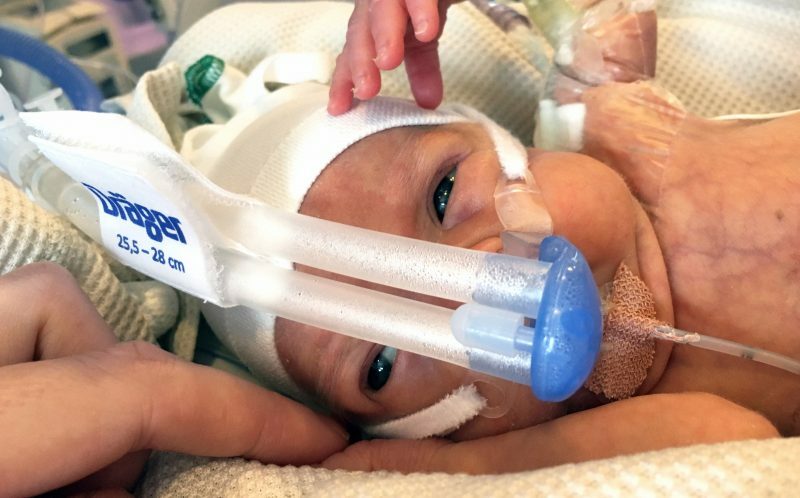 She was born at 25 weeks – just seven days over the cut off point for abortion in the UK – but against the odds, managed to survive. What makes her survival even more miraculous is that her dad Rhys, had been in a horrific motorbike crash just weeks before – and had cheated death by a second. 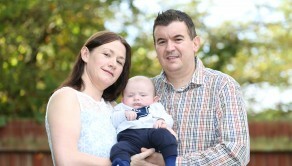 So when mum Karen Dawkins, 33, discovered she was 18 weeks pregnant, the couple were thrilled. But just over a month later, Karen went into premature labour – and medics warned the couple it was unlikely their new daughter would survive. Karen said: “When she was born she was the size of my hand. “I look back at photos and think how un-baby-like she looks, but at the time I thought ‘wow, what a baby’. Karen, a pub assistant manager from Worcester, discovered that she was pregnant at 18 weeks when she went to the doctors over Christmas. She said: “Macey’s dad had been in a motorbike accident, and it was in and out of hospital with him. “If he had been one second ahead of where he was he would have lost his life. “Being pregnant was not in my thoughts at all. “I went to the doctor and he said I was 18 weeks pregnant. PIC FROM CATERS NEWS – Baby Macey after she was born. However, it was not long before that pendulum swung back to bad news. After routine scans at 20 and 22 weeks showed everything was well, Karen received a massive shock at next scan three weeks later. 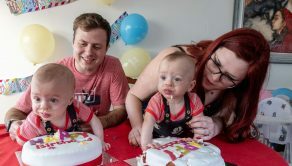 Karen drove with Macey’s father Rhys Micklethwaite to hospital in Gloucester Royal Hospital, but the next day she was transferred to Saint Michael’s Hospital, Bristol, which has a specialist maternity unit. After further tests she was diagnosed with a severe case of pre-eclampsia, a condition in which the placenta stops working effectively and oxygen and nutrient flow to the baby is reduced. Karen’s blood pressure had increased as her body had fought harder and harder to keep Macey alive. She said: “I remember sitting in hospital with Rhys and I felt fine. I thought they would just send me home. “I was unaware of the danger until I was transferred to St Michael’s. Then I was in disbelief. Tears came as I knew something was wrong. Medical staff at the hospital initially tried to hold off performing a C-section to increase Macey’s chance of survival. PIC FROM CATERS NEWS – Baby Macey help by her dad. Karen said: “The consultant told me they were trying to keep her in as every extra day can mean the difference between life and death. “But eventually they said it was now or never. They had to operate to keep Macey alive. “The fear was there and I was sad and anxious, and you never expect to be in that position. The C-section was successful and Macey was born on 20 February weighing a mere 551g. 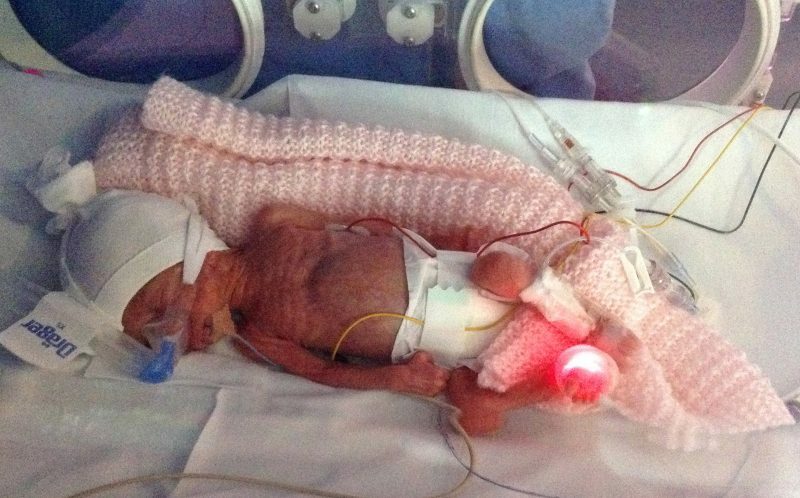 As she was so tiny, and her mother still very ill, Macey was raced off to intensive care. Karen did not see her for the first two days, in which time Macey’s weight dropped to 478g. She could only see photos that dad Rhys, a labourer, took. 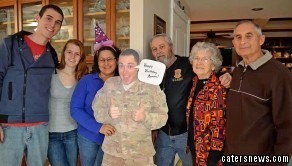 She said: “It was my birthday the day after I had her, and the birth was a joyous occasion. I would say it was the best day of my life. “It was good that she was fine and breathing on her own. Slowly both mother and daughter began to get stronger, although Macey suffered numerous setbacks along the way. In total, Macey was in hospital for two days short of five month before she was allowed to go home. Now eight-months-old, she weighs 3.9 kilograms. 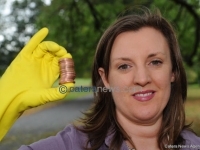 Karen said: “She got a number of infections and illnesses. She had part of her bowel removed. Her feeding was a problem. “Fortunately only things that were fixable went wrong. PIC FROM CATERS NEWS – Macey Micklethwaite was just 551 grams when she was born by an emergency caesarean section. “She is just a normal baby. She is small but catching others up. Health and development wise she is on track. Throughout the time that Macey was in hospital, Karen was supported by the charity Cots for Tots, which raises funds for life-saving equipment for premature infants and provides free accommodation to parents and siblings of babies at St Michael’s. To thank the charity, and to help support parents in a similar situation, she is now fundraising for the charity. 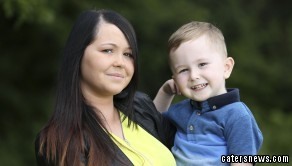 Karen said: “I think I came home three times in the five months Macey was in hospital. “The rest of the time I was in the accommodation across the hospital car park. 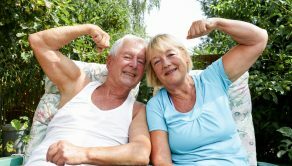 “I did not have to worry about any extra stress. I was right by the hospital and I had a direct line to the nurses. 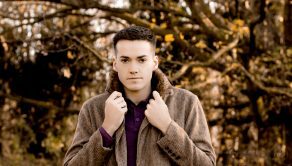 “There were also other families there who are going through the same thing as you, and messages from previous families too. “Having other families sharing the same thing gives you hope.